When you copy an image in Evernote by selecting it and choosing "Copy Image", iClip will only show a "?" instead of the image. The reason for that is that Evernote does not, as it should, put an actual images into the clipboard, but only a reference to an image file in a temporary folder. iClip will store that reference correctly so that you can still paste it back from iClip into other applications. However, if you then quit Evernote, the temporary image files get deleted from your disk. After that, you cannot paste the clippings any more because the file is gone. To fix this, you have to make iClip store the actual image, not just the reference to the file. This can be accomplished by adding some Applescript code to iClip. 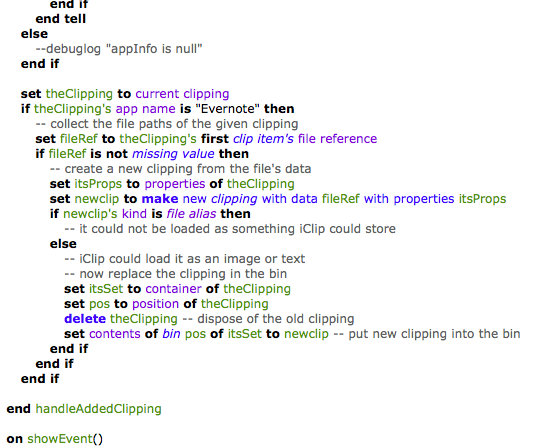 Download the iClip Events.scpt file from http://iclipapp.com/dl/scripts/Action%20Scripts/ and place it into iClip's Scripts folder as explained on the Scripting page. Open the iClip Events.scpt file in Script Editor (which is inside the Utilities folder, inside the Applications folder). If the script code looks correctly inserted, save the script and then test if it works by using Copy Image in Evernote.